Since the Chinese Communist Party (CCP) initiated its large scale persecution of Falun Gong, a few Falun Gong practitioners have gone to South Korea to avoid persecution. Currently, except for two practitioners, all applications for asylum are being denied, and the South Korean government has repatriated ten Falun Gong practitioners to China. On September 6, 2011, staff of the Seoul Immigration Office, Korean Ministry of Justice, entered the home of Falun Gong practitioner Mr. Kim by force to bring the couple to the immigration office. Mr. Kim’s wife escaped on the way to the office, and Mr. Kim was transferred to a detention centre on the same night. He faces repatriation to China at any time. 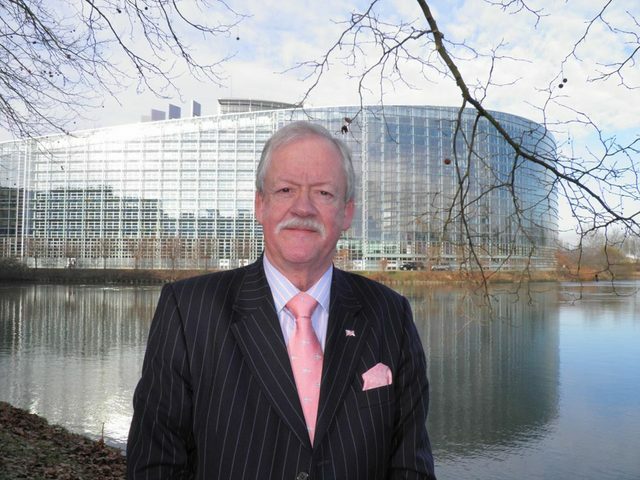 Roger Helmer, Member of European Parliament, wrote to the Ambassador of South Korea in England and called on the South Korean government to respect human rights and stop repatriating Falun Gong practitioners. 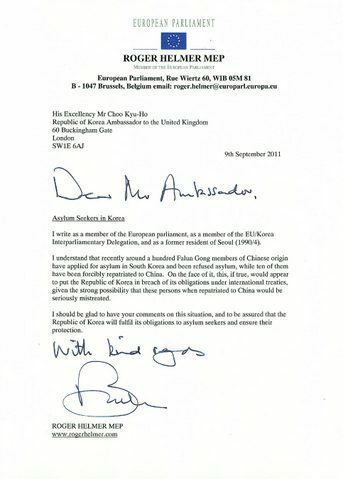 He wrote in his letter, “I write as a member of the European parliament, as a member of EU/Korea Interparliamentary Delegation, and as a former resident of Seoul (1990/4). “I understand that recently around a hundred Falun Gong members of Chinese origin have applied for asylum in South Korea and been refused asylum, while ten of them have been forcibly repatriated to China. On the face of it, this, if true, would appear to put the republic of Korea in breach of its obligations under international treaties, given the strong possibility that these persons when repatriated to China would be seriously mistreated. An official in the South Korean Government who does not wish to reveal his name disclosed to reporters of South Korea media that Li Changchun, a member of the CCP Politburo Standing Committee, pressured the South Korean government to “drive Falun Gong practitioners out of South Korea”. Before long, the Ministry of Justice of South Korea started denying asylum applications from Falun Gong practitioners. Repatriation then soon began. During the past two years, the South Korean government has repatriated ten Falun Gong practitioners to China. Mr. Kim, 26 years old, submitted his application for asylum to the Ministry of Justice. His application was denied. A South Korean court also denied his appeal. The Immigration office has put him on a list of illegal aliens and plans to repatriate him. A witness said that the immigration office took a very unusual action, as it rarely enters homes to take away people by force, especially at night. But Mr. Kim was taken away at night by force without a warrant. After Mr. Kim was brought to the immigration office, dozens of people, including Falun Gong practitioners, stood in front of the gate of the immigration office to protest its violation of the United Nations Convention on Refugees and infringement of human rights. They called for the release of Mr. Kim. An official at the office promised to release Mr. Kim at 10 a.m. the next day. Unexpectedly, a few hours later, Mr. Kim was transferred to a detention centre at 2 a.m. on September 7. Based on the South Korean immigration code, detainees in the immigration office have seven days to appeal before a decision is made to transfer them to a detention centre. Detainees in the detention centre face repatriation. The Ministry of Justice has handled Mr. Kim’s case in an unusual way that deprives him of his right to a seven-day appeal period. Some South Korean people have stated that such actions violate the UN Convention on Refugees and damages the image of South Korea.